"How much will it cost to hire a private security guard for my HOA?" After all, if you want to prevent crime, you need a security guard on-site 24/7, right? The average homeowner's association spans hundreds of acres. Do you really think a vandal will be outmaneuvered by a guard in a booth? Do your residents feel safer knowing there's a guy watching Netflix in a shack six blocks away? "But that guard can monitor security cameras across the whole neighborhood." Go ahead and search YouTube for "convenience store robbery." You can see security cameras don't prevent crime. They merely help investigators — after the guns have been drawn and the money is gone. The "patrol model" of security involves an officer driving between several properties per night. The officer's job isn't only to glance around, look for crimes in progress, and then leave. Instead, Signal 88 officers are trained to search for security hazards and opportunities for crime. This proactive approach involves perimeter and door checks, foot patrols, pool lockups, and anything else needed to be truly helpful in the communities we serve. "If security only comes to my property every three hours, doesn't that leave lots of time for criminals?" Signal 88's security patrols can be scheduled at randomized intervals, so bad guys can't predict when to strike. And because patrollers are always on the move, they're more alert and always prepared to act. There's no wasted downtime for snoozing or "extracurricular activities." Signal 88's patrol SUVs are literally a light in the darkness: each one is equipped with reflective graphics, lightbars, and spotlights. This strong and active presence catches the attention of trespassers and residents alike. And in the unlikely event of a crime or suspicious stranger, it helps Signal 88 serve as effective eyes and ears for law enforcement. GPS tracking helps ensure that we're protecting your community in real time. And the next morning, you'll find a digital, searchable, comprehensive report of the shift. "We would absolutely recommend Signal 88. Of all of our community's vendors, I'd say Signal 88 is the one we're happiest with." In this example, the HOA would save over $39,000 per year! The decision comes down to one question. If you could get a free security audit from a local expert, more peace of mind for you and your neighbors, and $39,000 in annual savings, would you be interested? Stop paying thousands of dollars for a sleepy guard in a faraway booth. 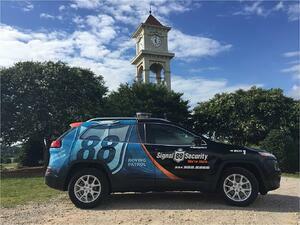 Call your local Signal 88 franchise today to see if mobile patrol security is right for your HOA. * This number is an example and should not be construed as an offer or guaranteed rate.